C.G.M. 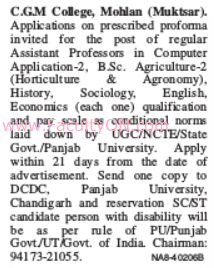 College, Mohlan has advertised in the TRIBUNE newspaper for the recruitment of Teaching Faculty- Assistant Professor jobs vacancies. Interested and eligible job aspirants are requested to apply within 21 days from 27th September 2018. Check out further more details below. About College: CGM College, Muktsar Punjab is a recognised institute / college. CGM College, Muktsar Punjab is also known as Comrade Gurmeet Mohlan College, Mohlan. CGM College is situated in Muktsar of Punjab state (Province) in India.